St. Aidan was an Irish Christian Missionary Monk from the Island of Iona who established a monastery on the Island of Lindisfarne in the Anglo-Saxon Kingdom of Northumbria in 635 CE in order to convert the residents to Christianity at the invitation of Oswald, the Northumbrian King. Aidan was the first Bishop of Lindisfarne and his monastery flourished. 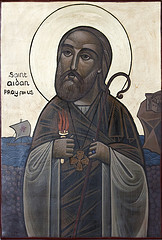 According to Catholic.org, Aidan was “known throughout the kingdom for his knowledge of the Bible, his learning, his eloquent preaching, his holiness, his distaste for pomp, his kindness to the poor, and the miracles attributed to him.” He died in 651 at Bamburgh Castle, the royal seat of the kings of Northumbria. The castle was built on a dramatic rock outcropping overlooking the sea, 150 feet below, on the site of a Roman fortress built to protect the coastline. The Feast of St. Aidan is traditionally August 31st.